Wouldn’t it be nice to create a wine-by-the-glass program without the limitations of sales data? Often details like purchase frequency andoptimal serving conditions inhibit a Master Sommelier from adding the perfect wine to their by-the-glass program. Wine dispensers, like WineEmotion UK’s Quattro+4 free up the restrictions, allowing for the professionals to create. 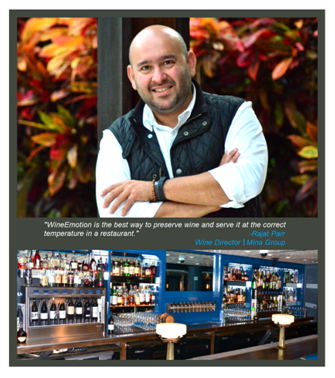 Last November, Michael Mina 74 opened in the Fontainebleau Miami Beach. The new restaurant created by Celebrity Chef Michael Mina, is often referred to as a “foodie haven” but what about the Wine Program? MM74 boasts a renowned wine program that pairs well with Mina’s expansive palate. Curated by Master Sommelier Rajat Parr, the program offers wine from Old and New World regions, exciting blends as well as many of Parr’s favourite rare vintages and vineyards. Traditional serving methods would make it difficult to offer such an exclusive by-the-glass program but Parr receives some help from the WineEmotion wine dispensing and preservation system. Often the most exclusive wines are left solely for full bottle purchases since it is tough to sell through a whole bottle by each glass. Typically an open bottle has 2-3 days once opened to serve before the wine’s integrity is compromised. The WineEmotion wine dispenser preserves the wine for 30 days giving ample time to sell through. Another exciting feature is the efficient and precise cooling system allowing for the wine to be served at its optimal temperature. The machines are capable of serving both white and red in the same unit. The exact pour amount feature is another plus. By providing consistent pours at pre-programmed amounts Parr can worry less about waste. Parr has used other wine dispensing systems in the past but quickly changed to WineEmotion upon its release at the end of 2012. “WineEmotion is the best way to preserve wine and serve it at the correct temperature in a restaurant” says Parr.The new patented features offered in each machine allows its users to focus less on limitations and more on creating a program that best reflects their creativity and inspirations. Rajat has been the wine director for Michael Mina Group since 2003. He originally pursued a career as a chef after graduating from the Culinary Institute of America in Hyde Park, New York. Rajat began visiting vineyards on his days off and began to find a deep interest in wine. Through his persistence and high acumen Rajat earned a very valuable apprenticeship with celebrity-sommelier Larry Stone. He has since published an award winning book, Secrets of the Sommelier along with opening several large budget restaurants.